Here's a nice surprise for all you nail polish lovers out there: Zoya is offering 70% off ANY purchase on their website on November 25th with code YAY. Great opportunity to stock up for yourself or fill some stockings. June empties! I continue to work my way through my closet of half used products. In June, I finished off Jason Biotin Shampoo, Shea Moisture Olive Baby Wash and Shampoo, and Alba Botanic Shampoo. Review: I have purchased the Jason Restorative Shampoo and Conditioner line several times over the years. They can really make a difference if you have damaged hair. My hair feels immediately softer after using the shampoo. The bottle is a flip top that you can store upside down so gravity keeps product available. My negatives about this shampoo is that it can be a bit too perfumed and that it is thin. The majority of organic and paraben free shampoos that I use are nice and thick (almost conditioner consistency). There is a lot of water in this shampoo. I would not recommend this for regular use because your hair will eventually go flat, but if you need short-term help, give Jason Restorative Biotin a try. Review: I am a big, big fan of Shea Moisture products. I have used them for several years. I generally stock up at the Walgreens sales. I used the Olive Oil and Marula wash as a shampoo. It smells to good. It also has avacado and shea butter. This is a very rich, thick shampoo. The quality of the Shea Moisture products is always something I appreciate. The shampoo is very thick and not watered down like the Jason's shampoo above. It takes very little product to wash your hair. No artificial fragrances. The ingredients create their own fragrance. Will repurchase this again. Aqua, aloe barbadensis, sodium lauryl sulfoacetate, cocoamidopropyl betaine, soyapropylkonium chloride, citric acid, panthenol, glycine soja (soybean protein), glycerin, oil of macadamia ternifolia, guar hydroxypropyltrimonium chloride, ananas sativus (pineapple), carica papaya (papaya), zingiber zerumbet (awapuhi), chamomilla recutita (matricaria), oil of aleurites moluccana, cocos nucifera (coconut), ethylhexylglycerin, amodimethicone, phenoxyethanol, glyceryl cocoate, macrocystis pyrifera (kelp), sodium benzoate, potassium sorbate, fragrance. Review: I'm not ashamed to say I buy this shampoo because of the way it smells. Every couple of years, I buy the Coconut Milk or the Gardenia varieties of shampoo. It's a tropical punch in the nose, so avoid if you have allergies or are sensitive to strong scents.The shampoo itself does the job. The Alba shampoo is mostly water. It's very runny. If you aren't careful, you will end up with a handful of shampoo. Will probably purchase again next year. I have been buying the majority of my beauty products from the Lucky Vitamin website. I used Vitacost for years before I found Lucky. Better prices and selection of the products I like. Sign up for their e-mail for discount codes. 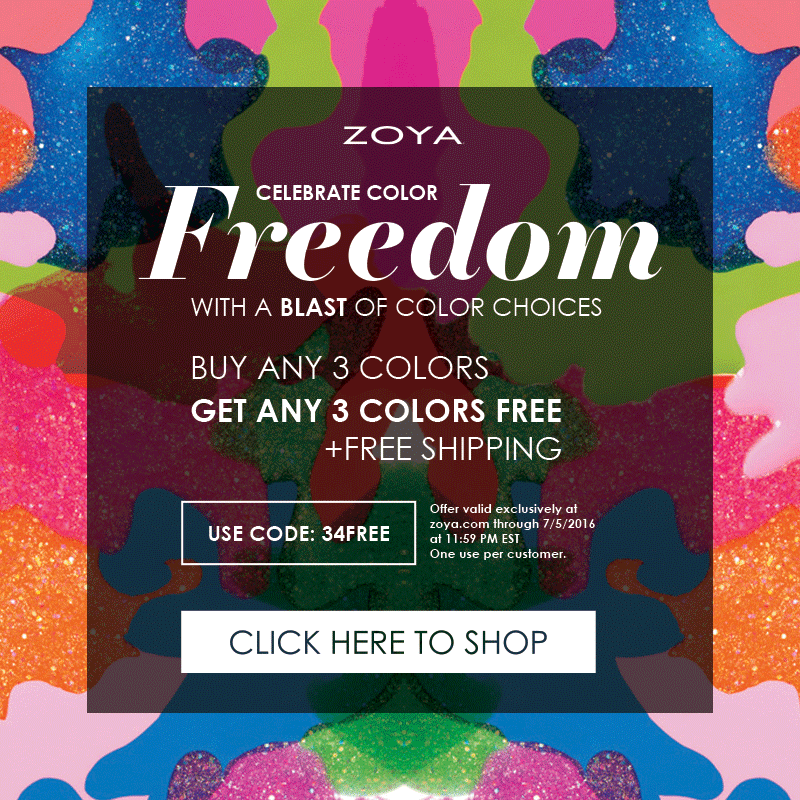 Just a quick note that Zoya nail polish is having a good July 4th sale. Buy 3 and get 3 free. Plus free shipping with code 34FREE. 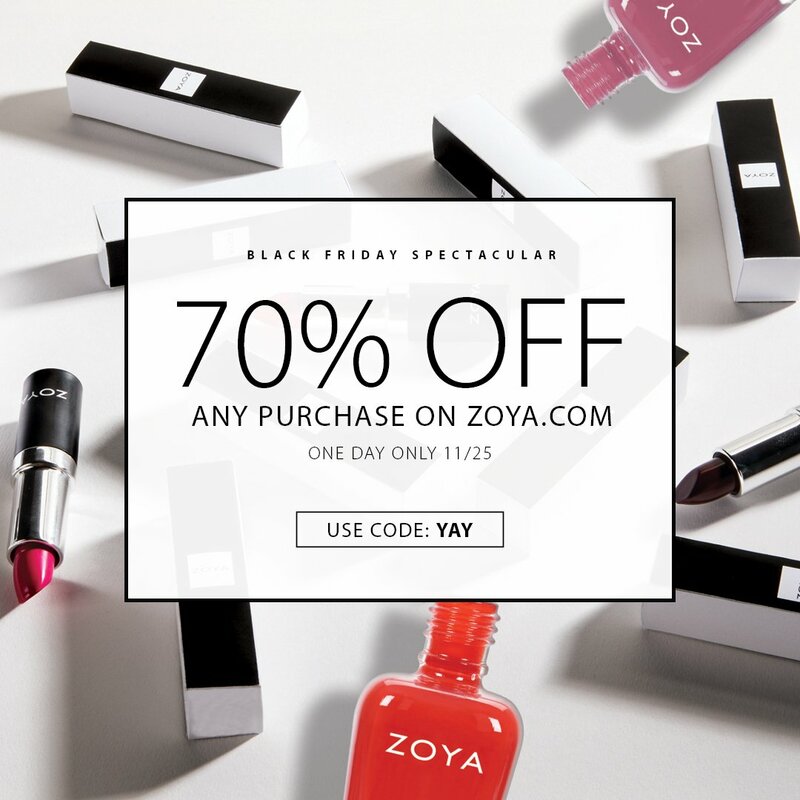 If you aren't interested in purchasing that many polishes at once, the code also appears to work for free shipping on a single item. I think it's time to stock up on new colors. I'm always banging my drum to check your makeup products for their expiration dates since they can carry Staph and other diseases. Well, here is a post to get you to clean our your medicine cabinet. You're probably going to need the big trash can for this one. We have two bathrooms, upstairs and downstairs. 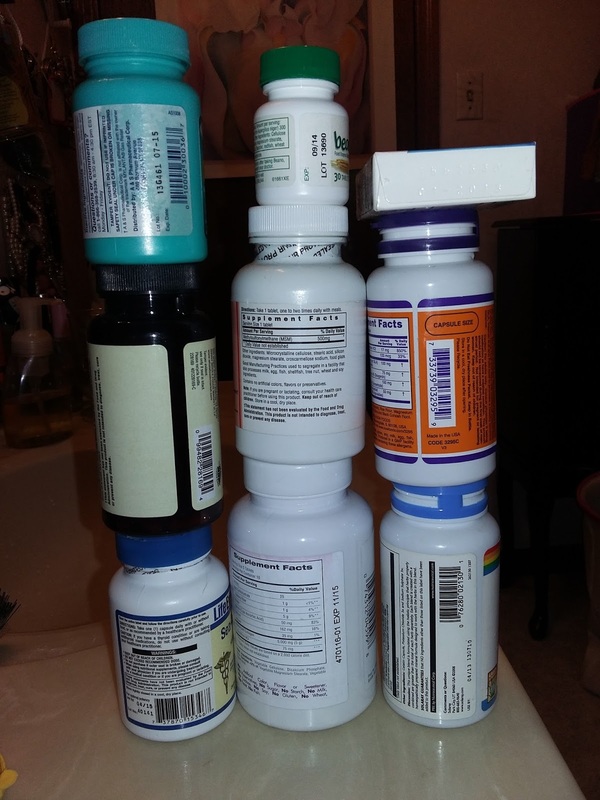 Over the course of a year, over-the-counter medicines, vitamins and related products float between the two, are replaced in one and forgotten about in the other. We don't need two bathrooms full of products, but that's how things migrate around the house. I got on a tear this weekend and cleaned out the bathroom cabinets, drawers and under the sinks. There were so. many. expired. products. In the downstairs bathroom, I filled up a kitchen trash bag with expired products, empty containers (!) and broken bits that had found their way to the back of drawers. The do we have any lipbalm? was answered when I found a dozen tubes in various corners of the downstairs bathroom. I'm not joking. This stack is what I pulled from my bathroom. Most of these are vitamins and digestive aids. Their expirations date from 2013 and up. I had a bottle of Tylenol not pictured that expired in 2011. That's FIVE YEARS out of date. I hung my head in shame. 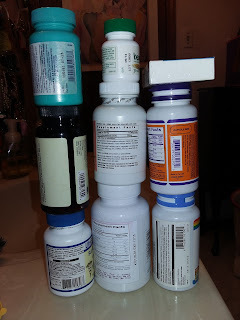 Aside from taking vitamins and medications that were woefully out of date, most of these bottles were barely used. We couldn't find X because it wasn't where it was supposed to be. Buy another one and start using it. The first one turns up. Circle of life. So much money wasted. I estimate this stack is about $50 in unused, outdated products. Ouch. Some suggestions I am implementing to keep our meds fresh and my money out of the trash can. Streamline medications - Do you really need 5 products for a single issue? Which products actually work well for you? Dedicate a single space for storage and return errant bottles there. Keep a special eye on the expiration dates of liquid medications, those tend to turn faster. Buy generic medications at the Dollar Tree or similar stores: aspirin, acetaminophen, ibuprofen, naproxin, allergy, Excedrine Migraine (20 pills for $1). Time to turn back the clock? Time to change your fire alarm batteries and the expiration dates on all the products you use. While a bottle of Vitamin B two years out of expiration probably won't hurt you, you won't get the same benefit as a fresher product. Vitamins and medications do break down over time, both physically and in potency. Since most people keep medicine in the bathroom, you have to factor in heat and moisture into the viability of expired products. I had a huge bottle of flax seed oil pills turn into a gelatin concrete mass because I kept it in the bathroom. Don't repeat my mistakes. Further discussion about expiration dates. Harvard: Drug Expiration Dates - Do They Mean Anything? Guidance from the FDA of prescription medication disposal. I strongly disagree with flushing medication down the toilet. For any "flushable" medications they name, I would recommend crushing them up and throwing them out with the cat litter, coffee grounds or something else fairly disgusting. The point is to keep them out of the hands of addicts. That doesn't mean you need to destroy the environment by putting them into the water system. I just ran across an article about Lily Farm Fresh Organic Skin Care and wanted to share their products with the readers. This company is based in Colorado and uses ingredients they grow on their own organic farm - 7th generation farmers. USDA certified organic. I think that's pretty cool. Let's check out some of their products. Lily'scustomers give them raving reviews. I signed up for the mailing list. I really like that this is a family operation and they are their own organic farm. Complete transparency. They even give you an interesting behind-the-scenes tour of their lab. My post about NYX Lipstick containing BHA and BHT from 2011 still receives quite a bit of traffic so I thought an update would be helpful for people who run across it. To summarize for new readers: NYX products are inexpensive but many contain ingredients that are known carcinogens, especially their lip products. Let me repeat that: Some NYX lipstick and lip gloss products contain BHA (a known carcinogen) and BHT (toxic for human immune systems) . What does BHA and BHT do? Both of these are antioxidants and fragrance maskers. They keep products fresh and smelling nice. About BHA: BHA (butylated hydroxyanisole) is a preservative and stabilizer; U.S. National Toxicology Program, a part of the National Institutes of Health, has classified BHA as "reasonably anticipated to be a human carcinogen" based on evidence of carcinogenicity in experimental animals. About BHT: Butylated hydroxytoluene (BHT) is a toluene-based ingredient used as a preservative in food and personal care products. Known human immune toxicant or allergen. Let's take a moment and reapply our lipstick. Having any second thoughts about NYX yet? I went through the NYX website's lip products and looked at the ingredients for all of their products. Here are the BHA and BHT winners for 2016. NYX does sell lip products that don't contain BHA or BHT. If they can formulate their new products without them, why can't they update the formulas for their older products that so many people purchase? Read your labels. As a consumer, you don't have to settle. Spend your money with companies who care about the health and safety of their customers. 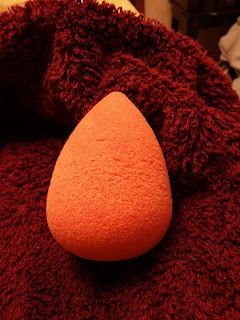 As I was giving my makeup brushes their weekly washing, I realized I've had that Beauty Blender for quite a while. Digging around on my past orders on Drugstore, I discovered that it and my 100% Pure Caffeine Eye Cream were the first things I ever bought on that website. Last month, that pink wobbly turned five. I'm kind of amazed it's still in relatively good shape. I remember the You Tube makeup gurus frequently complaining that theirs fell apart after a few months. I use mine almost every day and wash it weekly (sometimes more often). 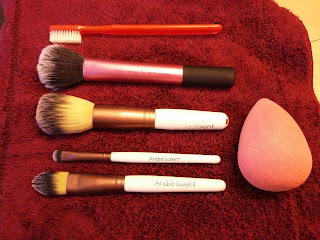 I don't use any special makeup brush cleaner or baby shampoo. I give the credit to another holy grail item, Desert Essence Thoroughly Clean Face Wash. I buy the giant 32 ounce refill jug. I put it into a foaming hand soap dispenser and wash everything with it, including my face. It easily removed the heaviest makeup from brushes and the Beauty Blender. Big fan here. It's rare that I do any type of haul these days. Most of my purchases are a re-buy of a holy grail staple that is always in rotation. I purchased a bar of the Roots & Fruits Apple Cider Vinegar & Honey soap about a month ago because I had been reading about apple cider vinegar on hair care forums. I have also been trying to move away from bottled shampoos to shampoo bars. I am wild about this ACV and honey soap! I've been using it exclusively as a shampoo bar for the past three weeks (review on that to come). Giving it a big thumbs up so far. This bar was created to help balance your skins natural pH and nourish your skin. Ingredients: Palm Oil, Kernel Oil, Water, Glycerin, Coconut Acid, Red Palm Oil (Elaeis Guineenis), Fragrance, Shea Butter, (Butyrospermum Parkii), Salt, Apple cider Vinegar (Acetic Acid), Aloe Leaf Juice (Barbandensis), Honey, EDTA, Mineral Pigment, Essential Oil. 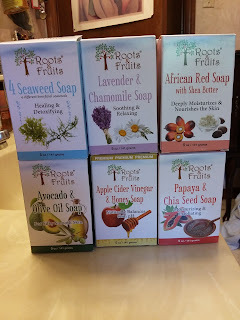 The tower of Roots & Fruits soaps are stacked two deep, so there are 12 bars in total. I bought these on Amazon. They are the full size bars and smell divine. Aside from the Apple Cider for my hair, I am also using the Papaya and Chia Seed soap. Makes the entire bathroom smell good. I want to get into all of them to test them out, but I am trying to be good. This will be enough soap to last me the rest of the year. I can guarantee Santa will receive a note to reorder these come December. 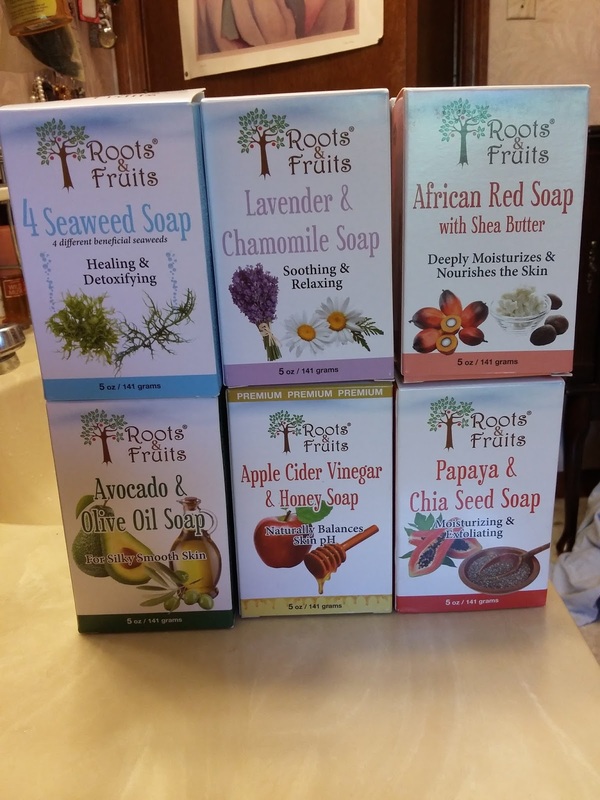 Learn more about Roots & Fruits Soaps. If you think that you only have to avoid parabens in your makeup and beauty products, think again. 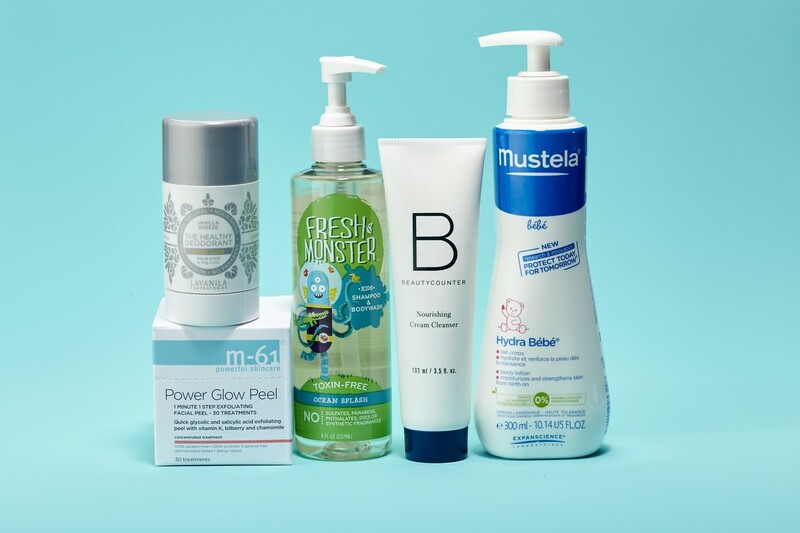 The National Institute of Health studied individuals from a fertility clinic to see how taking medication containing parabens impacted the concentration of parabens in their bodies. It's no surprise that actually ingesting something containing parabens will raise the levels of parabens in your body. You can read more about the study below. This study made me curious and I spent a few minutes searching for over-the-counter medications we actually put in our bodies. You always check the back of that bottle of lotion for ingredients, but do you check your suppositories? Preparation H should be called "Preparation Paraben". Those little suppositories contain both methylparaben and propylparaben. 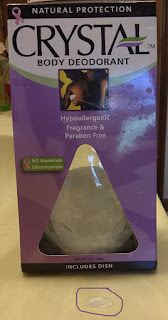 Children's Tylenol Liquid Contains Butylparaben. Determine whether paraben-containing medication contributes to high urinary paraben concentrations. Individuals at a fertility clinic provided multiple urine samples during evaluation/treatment and reported 24-hour use of medications and personal care products (PCP). Repeated measures models compared specific gravity-adjusted urinary methyl, propyl, and butyl paraben concentrations between samples “exposed” and “unexposed” to paraben-containing medication. Eleven participants contributed 12 exposed and 45 unexposed samples, among which paraben concentrations did not differ. Use within seven hours was associated with 8.7-fold and 7.5-fold increases in mean methyl (P=0.11) and propyl (P=0.10) paraben concentrations, respectively, after adjusting for PCP use. However, these associations decreased to 1.3-fold (P=0.76) and 2.6-fold (P=0.34), respectively, after removal of one influential individual. Paraben-containing medications contributed to higher urinary paraben concentrations within hours of use. When I saw the headline that Pope Francis met with You Tube beauty vloggers, I laughed. It had to be an Onion story. Nope. He met and praised fashion and beauty personalities for their positive messages and sense of community. Thinking on it a bit, I have to agree with him. Regardless of the topic, a good blog or You Tube channel can bring people together for a common interest and create a micro community. This is one hip Pope. Now, I just need to get Pope Francis on the paraben free wagon. "The eclectic group of 12 YouTubers addressing the pontiff included Louise Pentland, a British videomaker behind the Sprinkle of Glitter channel, who was praised by the pope for her fashion and beauty clips. The pontiff instead advised the videomakers to help those of their followers who feel lost. “You can create a virtual identity; you belong to this circle at least virtually. From that you can start taking a path of optimism and hope,” he said." 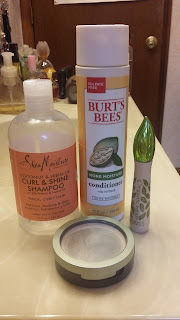 Just finished up Shea Moisture Curl & Shine Shampoo, Burt's Bees More Moisture Conditioner, Physician's Formula Organic Mascara and a powder compact by Carmindy for Sally Hansen. I've been trying hard to shop my bathroom closet and get through all of those half-used bottles and tubes before they expire. It's embarrassing how may bottles that are half full or less stacked up in the closet. I'll eventually make my way through it all. Eventually. Shea Moisture Coconut Hibiscus Curl & Shine Shampoo 13 ounces, $10. Review: I have purchased various Shea Moisture products over the years. Thumbs up on the entire line. The shampoo and conditioner are very thick and smell fantastic. Most shampoos are mostly water, you get your money's worth in this small bottle. Since it is so thick, use half the amount of what you would normally use. Rub it between your hands and then work it into your hair. Don't plop a squirt of it directly on your scalp, you need to work it through your hair. This version is made for thick, curly hair. My hair isn't curly but I use it because it is so rich and moisturizing. It made an immediate difference on my hair. Recommended. Burt's Bees More Moisture Conditioner 10 ounces, $8. Review: I'm a big fan of the Burt's Bees conditioner line. It is another very thick hair product that actually saves you money since it's not watered down. This smells great. Just a dab will do you since it's so thick. Start at the bottom of your hair and work your way up. I also used this as on occasional leave in. Recommended. Review: I'm a long-time user of the Organic Wear mascara line. Nearly a decade now? Before I went paraben free and used regular mascaras, I was losing several eyelashes every week. Since changing to this mascara, I lose one or two a month. This was a moment of enlightenment for me. I've tried most of the different versions that have come out, but I always return to the original or the Jumbo Lash. I wouldn't recommend their Fake Out mascara with fibers for daily use. Those little fibers fall off and into your eyes. The original is a holy grail product for me. I take it off with grape see oil (another holy grail product). A couple swipes and it's gone. Recommended. Try it! 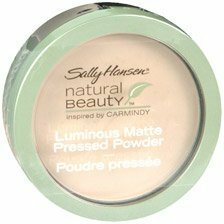 Sally Hansen Natural Beauty by Carmindy Pressed Powder. This one makes me a sad panda. I was a huge fan of the Carmindy line of cosmetics that Sally Hansen put out. The ingredients were great, they were quality products and reasonably priced. Unfortunately, Carmindy stopped partnering with Sally Hansen to start her own line (which apparently did not take off) and these wonderful products were discontinued. I was very upset. They gave me the perfect makeup line and then took it all away. You can still find the remnants of this line on Amazon and Ebay but I recommend against purchasing. They are near or at the end of their shelf life. I just threw away a couple of unopened lip glosses I had bought in my frenzy to grab what was left. I'm going to sit in a corner and pout for a while. I have been using Crystal Body Deodorant for a decade now. I initially started using the rock crystal because it was really budget friendly. A rock if used and kept properly can last you for years. No joke. I used my last crystal deodorant stone for three years before I needed to buy a new one. But don't you stink? Um, no. The minerals in crystal deodorant create a barrier on your skin that helps prevent bacteria from forming. No bacteria, no funk. I did experience a week of weird smells as I transitioned from using a solid stick deodorant to the crystal. I think my body was actually detoxing from having my pores clogged up by Secret for so many years. Learn more about how mineral deodorants work. I have tried the spray and roller versions of Crystal Body Deodorant but prefer the simple rock. It's just a big rock of mineral salts with a little tray. It's cheap and I'd rather not use a tube or plastic bottle when a good alternative is available. It's paraben free, aluminum chlorohydrate free and doesn't clog up your skin. It's safe for all ages. You won't be throwing out plastic deodorant tubes X times per year. It doesn't stain or smear your clothing. No more white stripes! Minerals are clear. You will save crazy money by using a crystal. I bought a 5 ounce rock on sale at Trader Joe's for $5.50. My 3 ounce rock lasted 3 years. You do the math on 3 years of deodorant tube$. It travels easily. No worrying about spills or airport security. You can use anywhere on your body. Say goodbye to stinky feet. My recent purchase of a 5 ounce deodorant crystal from Trader Joe's. It comes with a little storage tray. If you look closely in the circle, you can see the sliver remains of the 3 ounce crystal I used for three years. These crystals will last forever if you use and store them correctly. After my shower (and I shower every day), I wet the crystal in the sink and give my underarms a couple of swipes. That's it. If you are still shower wet, you can use the crystal dry but I prefer a little extra moisture. I give the crystal a quick rinse under the faucet and then store it in the tray in my bathroom cabinet. Store it wet side up. If you store it face down, it will melt a bit (it is essentially salt) and create a rough texture on that side. 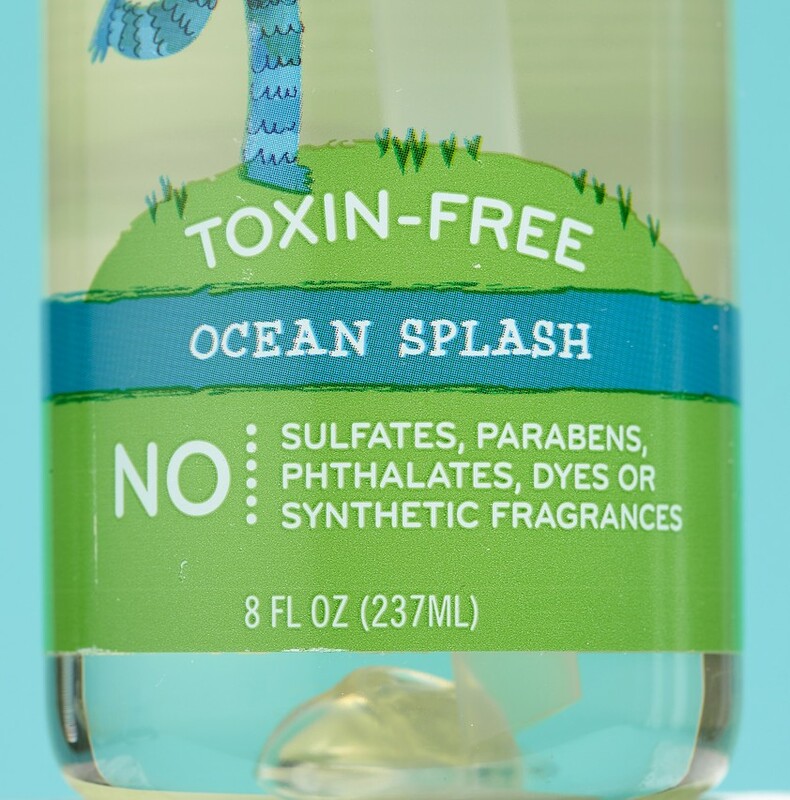 Enjoy the savings, being paraben free and environmentally friendly! When I first discovered the Circa Beauty line by Eva Mendes, I was really excited. The products looked solid and I loved the art deco vibe of the packaging. The reality of my product experience is not a positive one. All but one of the 5 products I purchased ended up in the trash within the first 30 days. I've held off on doing a review because I was so aggravated and disappointed, I needed some distance to review objectively. 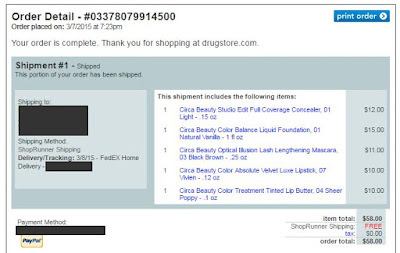 Walgreens.com, and Drugstore.com - even though the Circa website says it's only available at Walgreens. My first post about Circa was over a year ago. 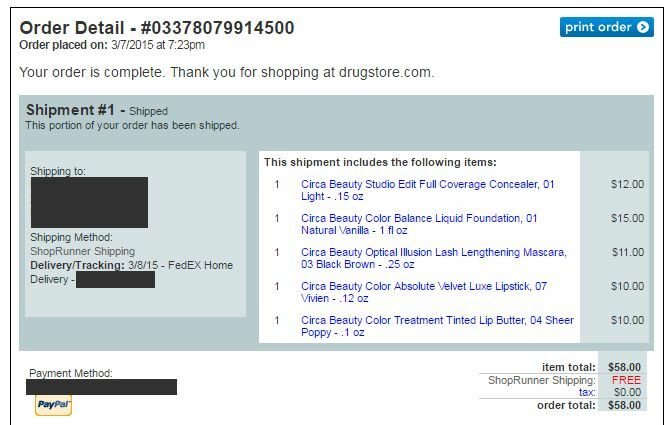 I ordered foundation, concealer, lipstick, lip butter and mascara from Drugstore.com for $58. My receipt is at the bottom. When I started unwrapping and unboxing items, I noticed how poorly made and cheap the plastic packaging felt. It was pretty but the package quality reminded me of Wet 'n Wild. That was my first disappointment. There was so much more to come. 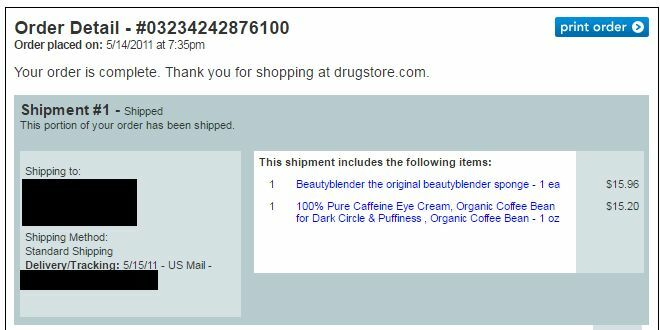 Looking back, I should have boxed everything up and sent it back to Drugstore and spent my $58 somewhere else. I was just too stubborn and determined to make these products work for me. Circa Beauty Color Balance Liquid Foundation, 1 ounce - $15. This is a very high quality foundation for the price. It is extremely thick and I have to cut it with a drop of facial oil. I may purchase this again. Solid glass bottle with a pump. The lid is cheap, ill-fitting plastic. I could turn the bottle upside down and shake it and the lid would fall off. I dropped this on the floor multiple times because of the lid. I eventually threw the lid away. Circa Beauty Studio Edit Full Coverage Concealer, .15 ounces - $12. This concealer crayon was broken when I received it. I pulled off the cheap plastic cap and half the product fell to the bathroom floor. I cleaned it off and shoved it back into the tube. I tried to use this product a couple of times, but the crayon felt dry to me. I thew it all out after the product fell out onto the bathroom floor again. Circa Beauty Optical Illusion Lash Lengthening Mascara, .25 ounces - $11. The first time I opened this tube of mascara, the cap on the end came off. Just slid right off. I don't think it was even glued to the wand handle. I tried to glue it back on myself, but the cap just kept coming off. This went into the trash after two weeks. The mascara itself was very good quality and had staying power. The wand did a good job of application. I had to really work to remove this mascara at the end of the day. Circa Beauty Color Absolute Velvet Luxe Lipstick, .12 ounces - $10. This is in the color Vivien. I actually laughed when I opened this tube. You can see in the product photo that it appears to be a subtle shade of pink. The actual lipstick was more of a coral neon flamingo. It was bright and it was loud, really loud. The packaging on this was slightly better quality than the others, but the lipstick was unusable to me. $10 out the window. I did try it on just to test the product. The lipstick is thick and provides full coverage. I left it on about five minutes before I could feel my lips drawing because of lack of moisture. Circa Beauty Color Treatment Tinted Lip Butter, .1 ounces - $10. 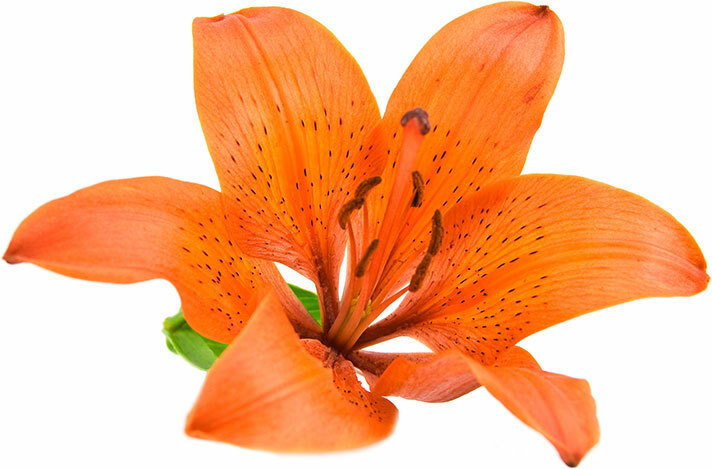 This is in the color Sheer Poppy. I received the color in the photo. The packaging for this was just awful. They packaged what is essentially a skinny Burt's Bees Lip Shimmer stick into a lipstick case. Not much product at all. That clear plastic lid just sat on the base, it didn't snap on. I tried carrying this in my purse, but after the third time the lid came off, I was tired of it smearing the inside of my bag. This went into the trash. The lip butter itself was nice. Subtle color and good moisture. I would buy it again if they would just package it in a regular lip balm tube. In the end, the only product from the Circa Beauty line that did not make it into the trash within 30 days of my purchase is the foundation. I still have a quarter of the foundation left and save it for when I need thick coverage. Overall, I think the Circa Beauty line has some quality products for the price. However, any advantage they may have with quality is being overshadowed by the cheap packaging impacting the user experience. Would you use a product that fell out of the tube every time you picked it up? Actress Gwyneth Paltrow wants to put her goop on your face. But that's not a bad thing when the goop comes from Juice Beauty. The new Phyto-Pigments collection looks promising. 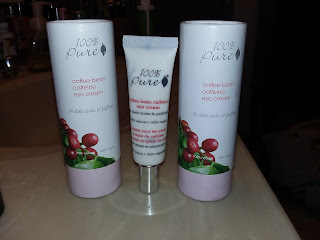 The pricing for this line is comparable with some of the higher end brands and may be a nice transition from those to something more organic - and paraben free. The collection contains mainstay pieces. The price point is a bit above what I normally would pay but they are definitely going on my wish list. Currently available on the Juice Beauty website and Ulta. Gwyneth also has a line of her skin care goop by Juice Beauty on her official site. Ingredients: Aloe barbadensis (organic aloe juice)*, carthamnus tinctorius (organic safflower oil)*, organic glycerin*, potassium cetyl phosphate, sorbitan sesquioleate, coconut alkanes, coco-caprylate/caprate (plant derived), gluconolactone (plant derived), cetearyl olivate (plant derived), sorbitan olivate (plant derived), sodium benzoate, decyl glucoside (plant derived), silica, hydroxyethylcellulose, sodium bicarbonate, citrus limonum leaf cell extract, helianthus annuus (sunflower seed oil), vitis vinifera (organic grape seed oil)*, tocopherol (Vitamin E), tetrahexyldecyl ascorbate (Vitamin C), argania spinosa (argan shell powder), rosa gallica (rose flower powder). May contain: titanium dioxide, iron oxides (CI 77491, CI 77492, CI 77499). Cocos nucifera (organic coconut oil)*, ricinus communis (organic castor seed oil)*, copernicia cerifera (organic carnauba wax)*, helianthus annuus (organic sunflower seed oil)*, rhus verniciflua peel wax, methyl dehydroabietate (plant derived), mica, euphorbia cerifera (candelilla wax), simmondsia chinensis (organic jojoba seed oil)*, isopropyl jojobate, jojoba alcohol, jojoba esters, tocopherol (vitamin E), helianthus annuus (sunflower seed oil), oryza sativa (rice bran extract), rosmarinus officinalis (rosemary leaf extract), polyglyceryl-10 heptahydroxystearate, butyrospermum parkii (organic shea butter)*, vitis vinifera (grape seed oil), sclerocarya birrea seed oil, rosa gallica (rose flower powder), malus domestica fruit cell culture extract, citrus limonum leaf cell extract, vegetable glycerin, phospholipids (plant derived), silica, magnesium silicate, betaine (plant derived), sodium hyaluronate crosspolymer. May contain: titanium dioxide, iron oxides (77491, 77492, 77499).